Some animals at Little Pond Maine are things that we just don't see here in Ohio, while others are common in both places. The bog that rims the pond is full of both male and female common yellowthroat warblers. The male has a bold black mask, while the female completely lacks this feature. 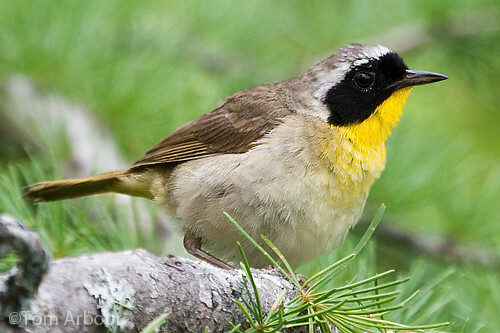 If you'd like to see common yellowthroat warblers in Ohio, look for them in scrubby, shrubby areas, especially near water and wetlands. Super photo of one of my favorite birds (simply because they look so great with that "mask.") One can hear them sing along the banks of the Rio Grande, but rarely get a glimpse, much less have them pose for a photo! Thanks Bill- This shot took a lot of patience and time just to get the birds to come near to me. I staked out a section of boardwalk at my parents bog, and sure enough, I got a good shot.